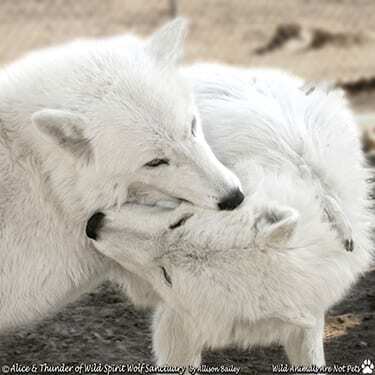 BIO ~ Thunder is a neutered male Arctic wolf. He was born on May 3rd of 2006 at a breeder’s home. He arrived at WSWS May 22, 2006, with his sisters, Alice, Sabine and Sugar and his brothers, Powder, and Storm. PERSONALITY ~ Thunder might be the best example of the fact that even though he and his siblings were hand-raised, they are still wolves. Thunder is very sweet and social around people he is comfortable with, but he acts differently around people he does not know well. He becomes nervous-aggressive and tries to scare them from his habitat by charging and nipping. RELATIONSHIP ~ Thunder lives with his sister, Alice, and high-content wolf-dog Forest, who he met when he was only a couple months old. The three live in a very spacious habitat on our tour path. Be sure to ask your tour guide to point Thunder out! LIKES ~ Like many of our braver rescues, Thunder loves inguinal rubs along his inner thigh. Not all our rescues are comfortable on a leash, but Thunder likes long walks away from his habitat. Everyone needs a change of scenery now and then! DISLIKES ~ Thunder dislikes being approached and would always prefer to be the one to initiate interaction. He also hates when Forest leaves the habitat without him. FUN FACTS ~ When Thunder was very young, he was called Bob! Although certainly a unique name for an Arctic wolf, we eventually settled on the name Thunder instead, which suits him quite well. A few people still call him Bob sometimes, though, and he knows they’re talking to him! WISH LIST ~ Thunder would like to have more people to sponsor him! Our sponsorship package makes a great gift and is a thoughtful way to support WSWS. Check out the perks! Thunder Only Needs One More Sponsor to Reach His Goal! THUNDER’S HISTORY ~ The story of Thunder and his family (The Arctics) and why they live at Wild Spirit is a long one, but we feel it is important to share it. On May 3rd, 2006, Alice and her siblings were born to captive-bred parents, Yukon and Sierra, at a breeding facility. The story we heard was that Yukon and Sierra were born to wolves who were taken from the wild. The breeder who owned Yukon and Sierra had been selling their pups to select private owners or for exhibits like zoos. Very sadly, in order for wolves to be socialized to humans at all, they must be taken from their parents before they open their eyes. Even then, they may remain too wild-spirited to be comfortable around people and will never behave like a domestic dog. For eight years, Yukon and Sierra had each of their newborn litters taken and sold. Before The Arctics became a part of Wild Spirit, we had rescued a very unique high-content wolf-dog named Raven the day before he was scheduled to be euthanized. High-content wolf-dogs have a bit of dog in their ancestry but look and act predominantly like wolves. Raven surprised us all and proved to be an extremely powerful part of our education efforts. He retained his wild spirit like all our rescues do, but Raven became comfortable in many public situations and enjoyed meeting people. Wild Spirit has grown a great deal since we became an official non-profit back in 1993. We realize we are always evolving, and we work hard to improve and change along the way to ensure we reach our mission statement goals of Rescue, Sanctuary, and Education. In order to ensure that our true message is heard and those most in need are offered help, we have decided not to seek out wolf puppies to socialize in the future. If there is a puppy in need of rescue and we can offer them sanctuary, of course we will. However, we know that the animals most in need are often older, already poorly socialized, and suffering from serious misunderstanding and mistreatment, so those are the ones that we will pursue most diligently.